Have you been wondering what Chris Colfer has been up to since Glee? Are you ready to read some self-insert celebrity real person fanfiction written by an actual celebrity? 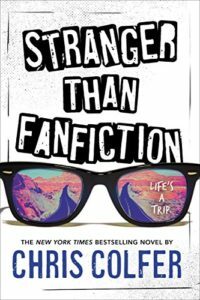 Honestly, you’re probably not, and we weren’t either, but we were happy to have Cory along for the ride with us as we read Stranger than Fanfiction by Chris Colfer. Have this podcast queued up to fill the awkward silence the next time you take a roadtrip with your best friends who don’t actually know anything about you! Candy Pairing: Cory says candy cigarettes, Kait says Nerds, Renata says a slushie. Coming up next: Having it All by Helen Gurley Brown (Part 2). Here’s what we suggest instead of/in addition to reading Stranger than Fanfiction by Chris Colfer. Listen to the podcast to hear us talk about some of these titles in more depth!